Veggies, let’s talk veggies. So many of you hate on the veggies. I used to be one of them, but now I actually have cravings for them. Like a couple days ago when I saw a kale carrot blueberry salad at the QT (gas station!) and I had to have it. Like right then had to have it. You could blame it on the shock of seeing a kale salad at a gas station but it was more the kale part that got me. One of the easiest ways to get your veggies in is to sneak them in like in zeggs and zoodles. 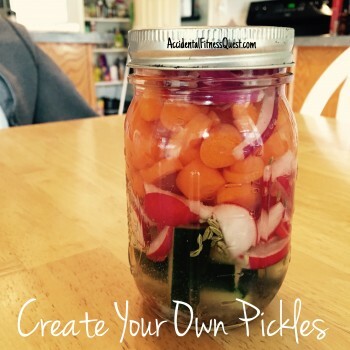 You can also save the brine from a jar of pickles and toss chopped veggies like cucumbers in there to pickle. Hey, pickles count as veggies! I used to do the pickle juice trick quite a bit, but I don’t like getting that much sodium. It can really add up fast when you munch away. I started making my own and it’s really beyond easy. Start with a 16 oz mason jar or other clean jar with a lid. Pack the veggies in there. You can layer them or mix them up. Add some spices, vinegar, salt and shake it up. Pop the lid on and refrigerate it at least overnight. The flavors really start to develop in about 3 – 5 days, but they keep up to 2 weeks in the fridge. 1. Pick a veggie. Here are a few ideas – cucumbers, carrots, cabbage, beets, radishes, onions. If they are thick like carrots or beets, slice them into coins or smaller pieces or they won’t pickle. 2. Pick a flavor. Play with spices here. Use about 1 teaspoon of each spice. 3. Add salt and vinegar. Add a teaspoon of kosher salt and fill the jar halfway with vinegar. You can use white vinegar, apple cider, red wine. 4. Fill the rest of the jar with water, put the lid on and shake to mix up the spices. 5. Refrigerate and enjoy over the next couple weeks. The pickled veggies go great in wraps, on salads, on top of tacos. I love playing around with the different flavor and veggie combinations. The one in the picture is cucumbers, radishes, carrots, and red onion mixed with mustard, coriander, fennel, cardamom and cinnamon for an Indian vibe. Once you get the hang of it, you can make larger batches and really get to experimenting. What combo are you going to pick to start with?